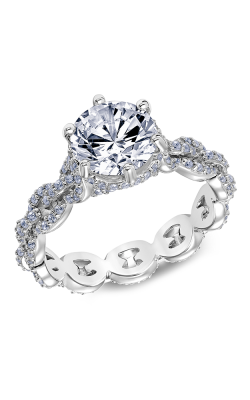 Scott Kay is the foremost authority in bridal and fashion jewelry. The brand has been a coveted source for bridal rings since its 1984 founding. Unlike competitors who never strayed from the standard gold metals for rings, Scott Kay shook up the industry by choosing platinum for his bridal collections. The craftsmanship and detailed, artisan designs earned the brand several awards, among them the Platinum Innovation Award from Platinum Guild International. The brand's motto "Never Compromise" is employed at every stage of the design process, resulting in impeccable works of art. 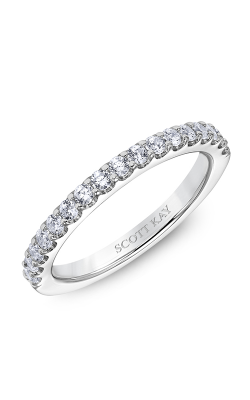 We are proud to showcase Scott Kay engagement ring and wedding band collections for both men and women. The signature guardian link is featured in both the Guardian and Embrace collections, meant to symbolize the enduring love of two people merging into one. Similarly, the Heaven's Gates collection are wedding bands that set a heartwarming statement of perpetual faith, commitment and togetherness. On a more whimsical note, we also offer the Luminaire collection, which is meant to capture the initial spark and attraction between mates. The glittering diamonds reflect the inner light and beauty of the wearer. The bride will sigh in peaceful contentment when she slips an engagement ring or wedding band from the Namaste collection on her finger. These rings represent the solid bond of mutual respect and spirituality. Couples should consider the Parisi collection, with arcs of diamonds to celebrate the cherished moments and milestones of a marriage. The Equestrian collection is a selection of men's wedding bands finely crafted with ornate braided details. Crown Setting rings are designed with a signature three-stone pattern for the couple to remember their past, enjoy their present, and dream of the future. Why Shop for Scott Kay at Long Jewelers? David Long is the founder and president of Long Jewelers, a retailer of designer wedding bands, Swiss timepieces, fine jewelry items, and engagement rings for more than thirty years and member of the Museum of Named Diamonds. We boast the largest jewelry showroom in Virginia and have been showcased in magazines such as InStyle. Long supervises a "Best of the Beach" team of five full-time jewelers, G.I.A. graduates, a C.O.S.C. certified watchmaker and a diamond cutter. From our Virginia Beach location, we serve customers in Norfolk, Chesapeake Bay and the Tidewater Area. We will respond to any inquiries about our products, services and onsite jewelry repair at Longjewelers.net or (757)-498-1186.